Over the past few years, we have become more and more aware of the benefits and uses of raw organic, unfiltered apple cider vinegar. For thousands of years raw, organic, unfiltered apple cider vinegar has been used for the health and well-being of people and animals. Many cultures have recorded uses of ACV through the ages. Its uses have been traced as far back as 3000 B.C. from the Egyptians to the Babylonians, the Greeks, and the Roman Empire. These civilizations used apple cider vinegar as a condiment, a preservative, for cleaning, as medicine and for various personal hygiene tasks. In 400 B.C., Hippocrates found that natural, undistilled Apple cider vinegar is a powerful healing and cleansing agent because of it’s natural antibiotic and antiseptic properties. It’s recorded Christopher Columbus carried it in barrels on his voyages. He did so for prevention of scurvy as did other famous sea captains. During the U.S. Civil War, it was used to disinfect and heal wounds. Since It’s So Amazing, What is ACV? Apple cider vinegar is made from fermented crushed apples, peel and all or the apple peels and cores. Some people keep the seeds in and some leave them out. When the fermenting begins, it changes from apples and water to cider and then to vinegar as it ages. I like making my own to save money. The heavier mother enzyme looks like webs or even just sediment. It can be seen settling on the bottom of the container or floating in the jug. Just shake the container to distribute the life-giving, nutrient rich mother. The pungent odor of ACV may even make your eyes water and it never needs refrigeration. Why use raw, organic, unfiltered ACV? Most of the general public buys food based on what it looks like and how it’s advertised, not on its nutritional value. This is a sad reality of our society. Vinegar producers began to produce pasteurized, refined, distilled vinegar because they have a more pleasing appearance than natural, unfiltered, raw ACV. What the public isn’t told is the process of pasteurization, refining, and distilling of “vinegar” kills all the healthy benefits of raw, unfiltered, organic ACV. All the potassium, phosphorus, natural sodium, magnesium, sulfur, iron, copper, other trace minerals, essential amino acids, and pectin are destroyed. Starting with organic, raw apples provides the healthy ingredients needed to produce the best apple cider vinegar. Letting the fermentation process develop the mother and all it’s health benefits in a raw (uncooked) state preserves the vital minerals, acids, and nutrients. Leaving the vinegar unfiltered ensures you that these same nutrients are readily available to you for use in your home, for your health, for your hygiene, and for that of your animals. While white, dead vinegar is fine for cleaning projects, it’s never to be consumed or used on the body. It is cheaper than raw, organic, unfiltered ACV so it’s a better alternative than harsh chemicals which pollute our homes,bodies, and the environment. For bigger cleaning projects I use white vinegar for cost effectiveness, but NEVER for our bodies or our animals. Clean Countertops and Appliances: I mix ¼ cup vinegar, 1-2 teaspoons of baking soda, and a couple drops of dish-washing detergent and apply to greasy, stuck on, or dingy areas of the countertops or appliances. Let it sit for a few minutes and then wipe off and rinse. If you have a stubborn stain or burnt-on place, let it sit for at least 30 minutes then wipe and rinse. Garbage Can: Clean and disinfect your garbage can with 1/3 cup vinegar to 2-3 cups of water. Let sit for a little while then rinse and dry. I let mine dry in the sun. Fruit Flies: If you have a problem with fruit flies or gnats, pour ¼ cup ACV in a bowl. Put the bowl in a plastic bag or cover with plastic wrap. Poke a few holes in the top of the bag or wrap and leave sitting on the counter. These annoying little bugs can’t resist the ACV and will be trapped inside and drown. Vegetable Wash: If you buy fruits and veggies, bring them home and wash them in a vinegar wash. The ratio is 1/3 cup vinegar to 2-3 cups of water. I use my ACV for this, but many people use white vinegar on fruits and veggies that are non-porous. This removes pesticides from the skin, germs from shipping and handling, and some say keeps them fresher a little longer. Digestive Issues: The mother in organic, raw, apple cider vinegar is vital in maintaining and restoring balance to the body’s digestive system. Put 1/3 teaspoon in your mouth and swish for 1 minute before swallowing it. This promotes the secretion of enzymes and saliva which jump start the digestion process. Reduce Insulin Spikes: Taking 1 to 2 teaspoons of ACV before meals is proven to dramatically reduce insulin and glucose spikes in the blood. If you or anyone in your family suffers from diabetes, then you know these spikes can damage many health systems including the heart. Fatigue Recovery: Mix two heaping teaspoons of raw organic honey and 2 teaspoons of raw organic apple cider vinegar in 12 ounces of clean water and drink. You will revive in a matter of minutes. Many old timers used this during the long days of harvest and planting. Restore Electrolyte Balance: First thing every morning, we drink apple cider vinegar tonic. We mix 3 teaspoons of ACV in 8-12 ounces of cool water and drink. This breaks the fast of the night by hydrating our bodies and restoring electrolyte balance. My grandfather was a believer in ACV while many of his counterparts weren’t. I can’t say it was the sole source of his success, but he never used a vet. His animals always brought top dollar at auction and were considered the healthiest around by many. We use apple cider vinegar for all of our farm animals. To us, it’s just as important how we care for their health and well-being as how we care for ourselves. After all, we are what our animals eat. For Dogs and Cats: Add 1 teaspoon apple cider vinegar to their water bowl. This improves the health of their coat, aids in removing toxins from their digestive tract, regulates the digestion and helps improve the general health of the intestines. It also will help dissolve fats which helps maintain a healthy weight. The main reason I do this is to boost their immune systems. I do this at season changes and anytime they seem a little sluggish. Mine seem to enjoy it for 1-3 days then they aren’t as thrilled about drinking the ACV water for I switch back to plain water. For Poultry: Mix 1 – 2 Tablespoons ACV in a gallon of water for your poultry. This boosts their immune system. I do this at the change of seasons or anytime my flock seems stressed or undergoes a stressful situation like a predator attack. Offer it for at least 5 days. I usually go for seven especially at change of seasons. The first few days they seem to drink it up like candy. When their water consumption goes down, I switch back to plain water. For Ruminants: ACV can have many benefits for them. Since it’s full of acetic acid, which gives them energy, it’s like giving them a dose of concentrated nutrition. The usual dose is 1 Tablespoon ACV:5 gallons water or 1 cup ACV:100 gallons of water for a maintenance dose. When applied externally, there’s no need for dilution. 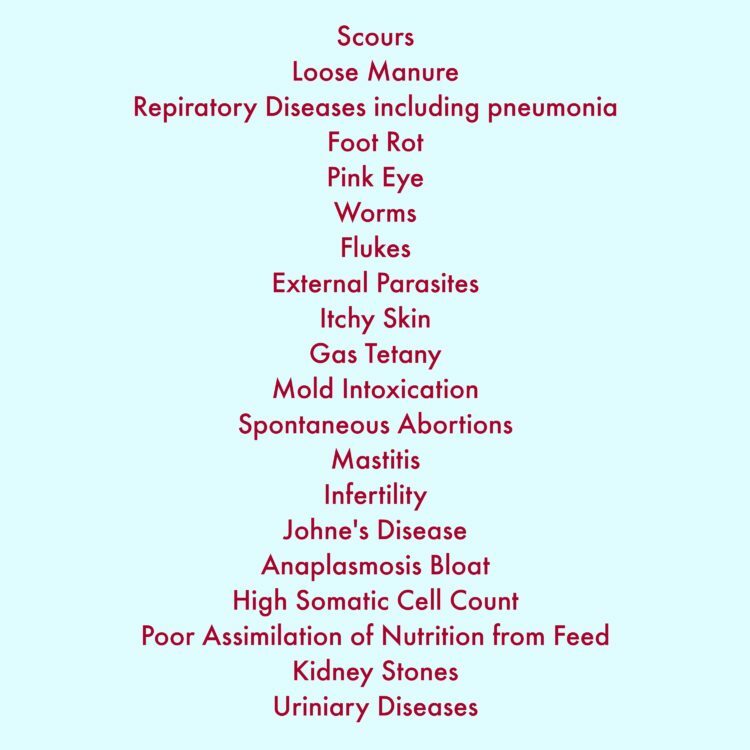 Many diseases of livestock can be prevented and helped with the use of raw, organic, unfiltered, ACV. 4. For Horses: ACV helps prevent intestinal stones. The improvement of the health of the hooves is remarkable. ACV is also an excellent insect repellent (for all livestock). It can be sprayed on to protect them from flies. Once you know the general uses and doses, expanding your scope of use will be easy. As a way of a disclaimer, I am not a medical doctor nor am I offering medical advice. 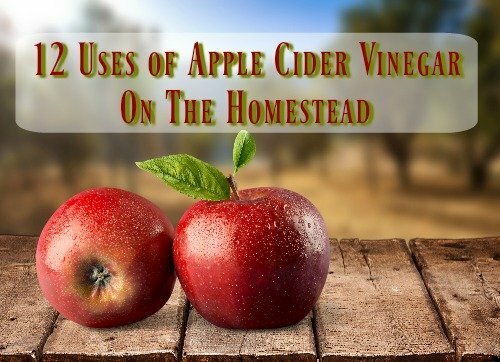 I am only offering you information on how we use ACV for ourselves, our home, and our animals. You alone are responsible for the health and well-being of your family. Be sure to inform yourself and make decisions based on the information you gather, not on any one person’s opinion. 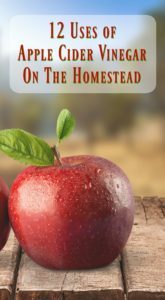 Our new book, “Apple Cider Vinegar On The Homestead” is finished and will be available on Amazon around October 1, 2016. We’ll let you know for certain the date as soon as we know. It’s filled with ways to use this marvel of elixirs for you and your whole homestead. We also give you doses and dilutions you’ll need for maximum benefit. I guess you could say these 12 ways to use apple cider vinegar are a teaser for the book! These are just a few of the thousands of uses for this marvelous master of elixirs. We made our own this year for the first time. We’re excited about it because it not only saves us a little money, it gives us another area of self-sufficiency.